Measurement (with disc in place): 11⅝" (30 cm) width, 9" (23 cm) height. Disc diameter is 10" (25.4 cm). In addition to the disc (Cat #71780-50) that comes with the Tissue Rotator above, we offer another disc with 24 outer holes for 13 mm diameter test tubes, and 10 inner holes for 28.6 mm diameter cups. The mini-rotator is a small, compact, rotator which is ideal for use on a lab bench; in a small incubator or refrigerator; in a biological cabinet; or in a fume hood or any other place where space is at a premium. 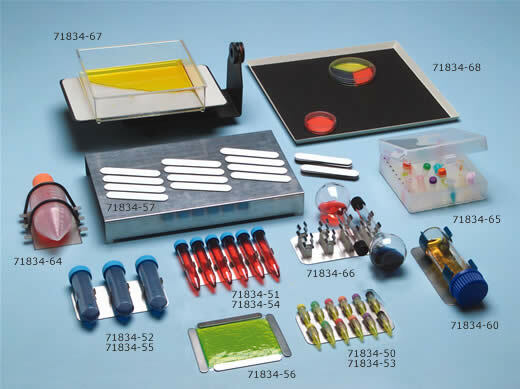 It handles both large and small applications for micro centrifuge tubes and micro test tubes. It is heavy duty and has a permanent-magnet motor which maintains constant speed with a variable speed control between 2-80 RPM and its mixing action is able to be adjusted from a gentle slosh to a rapid agitation. For optimum mixing, the chemical resistant cabinet is fixed at a 20 degree angle. Unit comes complete with an aluminum disk head with spring clips to hold 15 each for both 5-10 mm and 12-14 mm tubes. 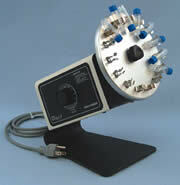 An option of 30 position tissue culture tube head is available. Electrical Speed Control with ON/OFF Switch and protected-fuse, 6 ft, 3-wire cord. 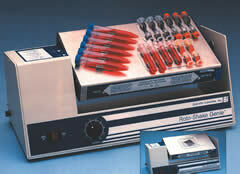 The BenchBlotter 2D Rocker is made for common molecular lab applications such as staining, destaining, blotting, etc. Lightweight – can be easily transported to incubators or cold rooms. Optional stacking platforms are available (EMS Cat. #s 65700-02, 65700-05) which will double your work area. Easy-to-use! Just turn it on! A stacking platform, 12 x 12", with dimpled mat. For use with our BenchBlotter Rocker above. The BenchRocker™ 2D Rocker will provide the exact speeds and tilt angles needed for many molecular and biological mixing applications. Set the parameters to match your vessel size and volume of liquid for best results. 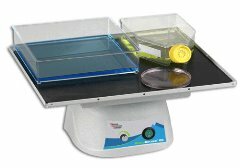 It features a large 14 x 12" work surface and is safe for incubators and cold rooms. The optional stacking platform gives you twice the work area. The Everlast™ 247 Rocker is made to last. Its powerful motor and heavy-duty drive system are consistent and reliable, even with constant use in cold rooms or incubators. The rocking speed and tilt angle are easily adjustable for gentle or aggressive agitation. It features an extra large 16 x 12" work surface. Double your work area with the optional stacking platform. The standard platform and optional stacking platform are made of stainless steel to prevent corrosion or rusting. It will give you years of uninterrupted service. The TubeRocker is designed to provide the ideal speed and tilt angle for the agitation of sample tubes. The grooved design of the included rubber mat properly secures all tube sizes ranging from 1.5 to 50 ml, without the need for added straps or bands. 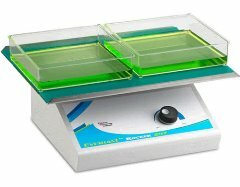 Small 5 x 13" size makes it easy to fit on any lab bench. It can be conveniently placed inside refrigerators, cold rooms or laboratory incubators. Simple-to-use. Needs no adapters or mounting hardware. Just press the power switch and let it rock! Rotator/Rocker – The one that does it all! Change between Rocking & Rotating Quickly & Easily. Combination platform/tilt, shaker, rocker, and specialized rotator mixes tubes in 6 different ways: rotating, rocking/shaking, rotating/rocking, rolling/rocking and rotating/rolling, as well as a combination of all these mixing actions. 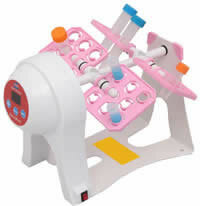 An optional 3-D Orbital Shaker attachment transforms the unit into an orbital shaker. Easy to remove, two-sided 8" x 13.5" (20.3 cm x 34.3 cm) stainless steel magnetic platform easily converts from rotating to rocking with a simple mechanical adjustment. The platform is magnetized to accommodate up to two 6" x 6" (15.3 x 15.3 cm) plastic bags per side, a 12" x 12" (30.5 x 30.3 cm) non-skid metal rocker tray for conventional rocker/shaker operations, or up to four metal clip plates per side to accommodate similar or different tube sizes for various mixing solutions. 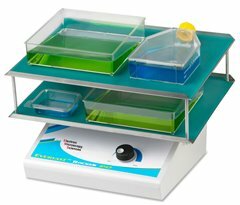 Ideal for use in cold rooms and incubators for complete and even soaking of membrane-based blot assays/washings. Unit can be easily cleaned or decontaminated. Maintains the set speed between 32°F (0°C) and 100°F (38°C). 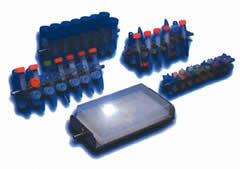 Expansion kits are available for increased capacity, and different containers. Capacity Combination of 4 Paddles of 7x10/15 ml Tubes, 7x5/7 ml Tubes, 15x1.5/2.0 ml Tubes, 21x0.5/0.8 ml Tubes. One Paddle of 6x50 ml Tubes. The Rotamix units are designed with interchangeable 12" long rotary rods accommodating tubes ranging from 1.5 ml to 50 ml, which make the rotary universal. Rotamix is made from steel, coated with a chemically resistant paint and is extremely quiet. Rotamix® is suitable for use both in the cold room and the incubator. The speed is variable from 0 to 80 RPM. On the RKVSD, rotation speed is displayed on a large LCD. Material Chemically resistant coated steel case,Stainless steel rods. All units are analog controlled and come without racks. Racks are sold separately. Designed to provide the security of precise temperature control and uniformity for demanding incubation/refrigeration application without taking up a great deal of space. It uses Thermo-Electric (Peltier) refrigeration & heating with no compressor. Chamber air is gently and continuously recirculated at a rate that ensures the temperature consistency and uniformity of all test samples. Re-circulated air eliminates the possibility of contamination from outside air. Shatter resistant viewing window allows for inspection of samples without effecting the chamber environment. Applications include the study of microorganisms and tissue cell growth under strictly controlled conditions of temperature and agitation. It performs membrane based assays/washing and hybridizations more efficiently. Microprocessor controls easily achieve desired rotating, rocking, stirring, shaking, temperature and time; all of which are displayed on large LED's for accurate reproducible results. Timer displays elapsed time or remaining time until programmed off – up to 96 hours. Visible and audible alarms for both temperature and time. Equipped with RS232 port for connection to your computer. Please see image in 71834.